Australian-owned company, Red Baron ALSE, offers Aviation Life Support Equipment solutions for organisations and industries such as Law Enforcement, Special Ops, Search and Rescue, Emergency Medical, Aerial Delivery, Government agencies, and Defence Forces. We also supply flight gear for film and television projects. Our company is a highly reputable and established leader in the development, service and sales of Aviation Life Support Equipment through specifically tailored packages. 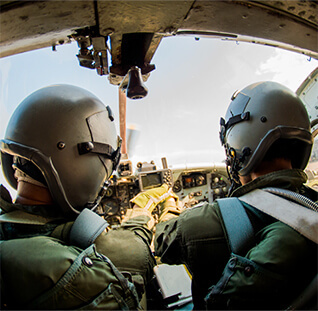 Having had decades of hands-on experience with aviation safety equipment in both operational and hostile conditions across the globe, our accomplished staff provides meticulous expert technical support and instruction to military and commercial aircrews, assuring survival is in the safest hands possible. Our manufacturing facility provides exemplary service, modification and repairs for flight helmets, plus sales and distribution of Aviation Life Support equipment. We are passionate about the research, design and development of such products for Defence Force projects. Our partnership with Original Equipment Manufacturers, in-house customisation, and best-practice manufacturing, ensures a superior nationwide and international service. Our cutting edge Next Generation technologies enable outstanding solutions for specific Aviation Life Support Equipment projects. Other products and services include flight helmets, life vests, life rafts and survival gear customised to specific theatres of operation. Our distinct policy of partnership with OEMs and a dedicated unique whole-team approach is appreciated and valued by our esteemed customers and suppliers.